If you are looking to for a holiday or short break in Dumfries and Galloway, South West Scotland then Byre Cottage provides some great self catering accommodation for you. Self catering accommodation at Byre Cottage sleeps 4 with	2 bedrooms	and prices for a weeks stay start from just £242. Set in the rural heartland of Dumfries and Galloway on a working farm on a stunningly beautiful 650 acre estate these delightful cottages have been tastefully converted from various farm buildings to provide comfortable accommodation in a wonderful location. As well as enjoying splendid views of hills and countryside visitors to the cottages enjoy access to a grass tennis court croquet and fishing on the River Tarff. Farm tours walks wildlife and coffee shop facilities are all available at the new Barstobrick Activity Centre on the estate. The local area has plenty to offer including horse riding and many good fishing spots nearby and several golf courses locally. Within 5 miles are the lovely safe sandy beaches of the Solway coast and at Loch Ken (10 miles) there is a superb water sports centre offering sailing windsurfing canoeing and waterskiing. Shop and pub 3 miles. Byre Cottage is situated at Fellend Ringford, Castle Douglasin Dumfries and Galloway. A map is below but if you are travelling by car the all important Sat Nav settings are: Latitude 54.90626, Longitude -4.05616 or postcode DG7 2AT. 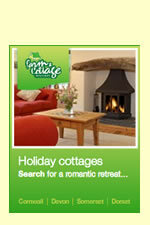 We have a wide range of Dumfries and Galloway self catering cottages and apartments for you to choose from including luxury cottages with hot tubs, pools, open fire, wi-fi and games rooms to cottages ideal for a romantic break or short break. We also have some great locations in Dumfries and Galloway close to the beach, near a pub, or within easy reach of fishing or golf courses.